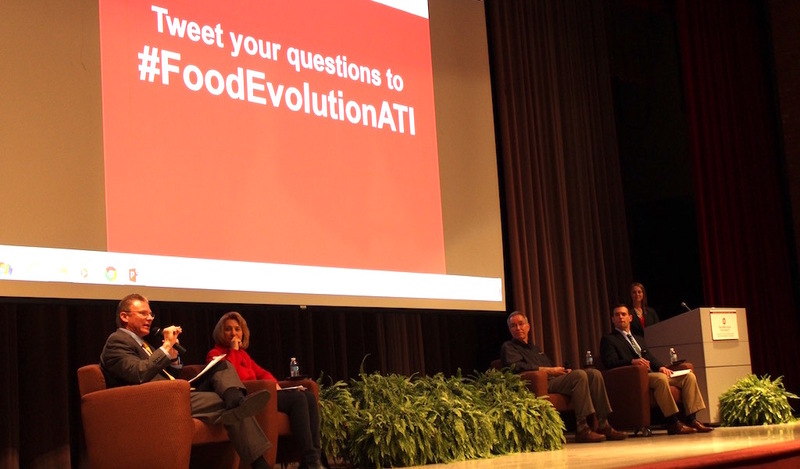 The movie FoodEvolution was shown in Wooster Nov. 7, followed by a panel discussion. WOOSTER, Ohio — They might be the three most controversial letters in agriculture, but the discussion on GMOs Nov. 7 at the Ohio Agricultural Research and Development Center in Wooster was civil and informative. Known as Genetically Modified Organisms, this technology of altering genes for beneficial growth was the center of a documentary called Food Evolution. The movie was shown in Fisher Auditorium to about 650 people, who later took part in a panel discussion with four food and agriculture experts. The movie was produced by professional writers Trace Sheehan and Scott Hamilton Kennedy, and included interviews and speeches by scientists and activists on both sides of the debate. A special focus was on Hawaii, where there have been multiple efforts to ban GMO crops over concern that they could lead to diseases, health defects and environmental harm. But scientists in the movie disputed those claims, pointing to a lack of any data or evidence. The activists claimed there has been a correlation between the increased use of GMO crops, and increases in conditions such as autism. However, scientists noted that there is not scientific reason that would point toward “causation,” or the likelihood that GMO crops are the cause for these conditions. The scientists said there has also been an increase in organic food consumption over recent years, which equally correlates with the increase in autism — but is most likely not the cause. The movie, which was made available to viewers as part of a screening, featured dozens of short interviews on both sides of the discussion, but refuted claims that GMOs are harmful. Funding for the movie came from the nonprofit scientific society Institute of Food Technologists. The organization at times debated whether it wanted to continue with the project, telling the writers that IFT wasn’t convinced the GMO issue was relevant to their members, and that the debate could be so controversial that it could become a distraction. During the panel discussion, Glenn Mott, vice president of compliance at Gerber Poultry, talked about his company’s decision to use GMO corn and soybeans, and how using non-GMO varieties would be impractical. Gerber Poultry consists of about 150 poultry housing facilities in four counties, operated by individual farmers. The feed is custom manufactured and supplied to all farms, at a cost of about 33 cents per dollar of poultry sales. Mott said a switch to non-GMO feed would increase the cost to about 44 cents per dollar of sales, and the company and its farmers would face a huge challenge because they would not have enough land to grow enough crops. He estimated all of the Gerber Poultry farmers together have about 18,000-24,000 acres. If they were going to take on the challenge of growing lower-yielding, non-GMO crops, they would need about 40,000 acres, plus separate trucks and storage facilities to keep the grain segregated. In the end, it’s just not realistic. GMO crops provide an opportunity for higher yields, as well as insect and weed resistance. They also provide the opportunity for better plant use of water, in some instances. As shown in the movie, GMOS helped revive Hawaii’s papaya crop and have the potential to help feed the world — at a time of increasing population, and increasing issues with insects and disease. However, as the panelists and audience noted, feeding the world means GMO crops need to be accessible. In some cases, that may require compulsory licensing, or allowing other companies to produce the patented product, while awarding the patent holder a fair market share. Tudor said farmers have always looked for ways to be innovative while dealing with limited resources, and that GMOs are one such innovation. Gabe Middleton, a veterinarian with Orrville Veterinary Clinic and president-elect of the Council for Agricultural Science and Technology, said science is constantly evolving and new ways of treating and preventing disease are emerging. He said while GMOs are working now, there could be something even better in the future. The same is true of antibiotic use in animals, he said, adding hope that some antibiotics will be replaced in livestock in the future, because of improved breeding. But when something is scientifically proven to work, and safely, he feels farmers should be allowed to use that tool. “I think that precluding a technology that is sustainable might have more of a negative environmental impact” than allowing it, he said. Cathann Kress, dean of OSU’s College of Food, Agricultural and Environmental Sciences, said it’s important for young people to be educated about the ag sciences and the technical nature that’s part of modern agriculture. She said farmers and researchers need to be mindful about how they present their work, and the image people have about farming. She also encouraged the audience to continue the GMO discussion — even if it leads to some spirited conversations. Food Evolution is available through Amazon.com. You can find a schedule of upcoming screenings on the movie’s website.